We have all heard about the extravagant feasts and banquets of the Medieval times of the Middle Ages. Menus for the wealthy were extensive, but only small portions were taken. Social etiquette dictated that an extensive choice of foods should be made available. A change in society had emerged during the era of the Middles Ages when travel, prompted by the Crusades, led to a new and unprecedented interest in beautiful objects and elegant manners. This change extended to food preparation and presentation resulting in fabulous food arrangements with exotic colors and flavorings - especially when preparing a Middle Ages banquet which was fit for a king. 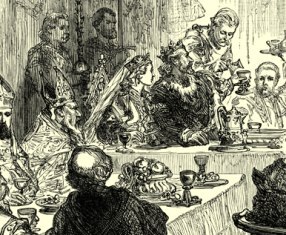 The Medieval Times website provides interesting facts, history and information about Medieval times including Medieval Banquets. The Medieval Times Sitemap provides full details of all of the information and facts about the fascinating subject of the lives of the people who lived during the historical period of the Middle Ages. The content of this article on Medieval life and times provides free educational details, facts and information for reference and research for schools, colleges and homework for history courses and history coursework.